James W. Wagner, president of Emory University, serves as vice chair for The Presidential Commission for the Study of Bioethical Issues. The Presidential Commission for the Study of Bioethical Issues released today the executive summary of its “Report on the Ethics of Synthetic Biology and Emerging Technologies.” The report — available at www.bioethics.gov or by downloading it below — includes 18 recommendations for negotiating the risks and benefits of the emerging field of synthetic biology. Amy Gutmann, president of the University of Pennsylvania, serves as commission chair. 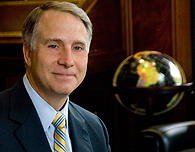 James W. Wagner, president of Emory University, serves as commission vice chair. They were among a panel of 13 scientists, ethicists and public policy experts who studied the implications of synthetic biology following the May 20 announcement by the J. Craig Venter Institute that it had inserted a laboratory-made genome into a bacterial cell, creating an organism not found in nature. The panel has held three public hearings in the past five months in Washington, D.C., Philadelphia and Atlanta. The commission heard from more than three-dozen scientists and others, and considered a range of possible actions government could take to prevent problems that might occur in the future. FAQ from the bioethics commission: What is synthetic biology?